Which are the best Sandals Resorts to stay at and how to find appropriate one for yourself ? Since every single Sandals resort has its own pros and cons, every single person has different priorities and expectations, wish list and budget, it’s a tough question. 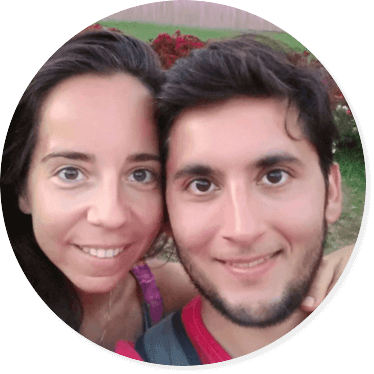 According to this, we made a list of all the resorts with all the information you need in order, to make your decision easier. 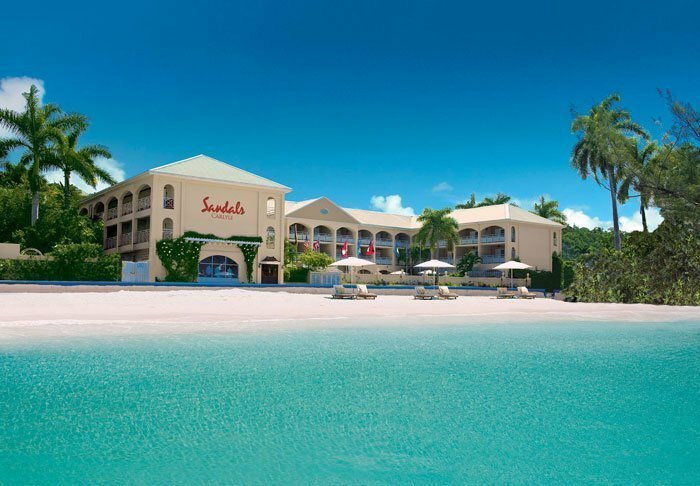 Sandals is a chain of 16 all-inclusive resorts on 6 the most amazing Caribbean islands including Jamaica, Antigua, Bahamas, Grenada, Saint Lucia and Barbados. All resorts are located directly on a stunning beach, famous for its crystal clear turquoise water and gorgeous white sand beaches. 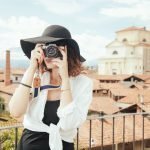 These luxury vacations are an excellent choice, especially for couples, families, honeymoon, wedding celebrations or anniversaries. Sandals LaSource Grenada Resort – Jamaica. In addition to this it is worth to mention Sandals offers a special promotion for scuba diving in each one of their resorts. 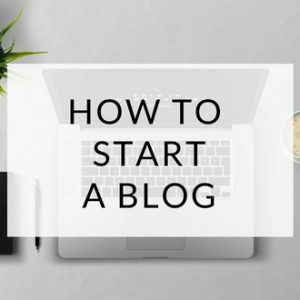 Click here to read more about it. 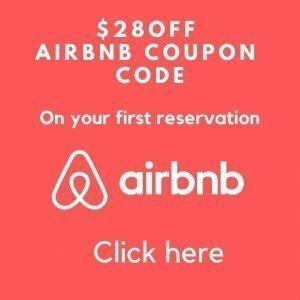 Last Minute Deals – Get up to 65 % OFF Rack rates! Get up to $1000 booking credit, up to 65% rack rates, and much more when you book now. Special discount for Military Servicemen, firefighters and police Receive – GREAT Savings At Sandals Resorts. Here is our list of best Sandals Resorts with clear information, pros and cons based on travelers reviews. People ask “what is the best sandals resort in Jamaica ? “. 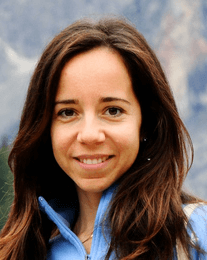 Here in this section we talk about the pro and disadvantages of each one. It is an original flagship of the Sandals Resort chain. Sandals Montego BaySandals Montego Bay is a good option for a couple looking for all-inclusive, luxury vacation, with various activities and dining options. There is plenty to do, you can visit downtown Montego Bay, experience local attractions, make tours around the island, visiting shops and attending shows. This is definitely one of the best Sandals in Jamaica and in the Caribbean. This resort is approximately 10 minutes from/to the international airport and offers free shuttle to/from the airport. Large property with numerous of amenities and activities (land and water sports, evening entertainments, spa treatments, fitness center). Set on the best private white-sand beach in Jamaica. The beach is clean and well-maintained. Modern, luxury rooms and suites, very clean and tidy with a breathtaking view of the beach. Available also butler suites with a private butler. Pools with one swim-up bar as whirlpools overlooking the ocean. The spa is awesome. It is possible to have a message on the beach. The fitness center is offering a quality equipment. The food is very delicious. Other services: photographers, rentable beach cabanas. Free “restaurants, bars and activities” options at the resorts Sandals Royal Carribean and Sandals Carlyle. Due to proximity to the airport, it creates a lot of noise from the airplanes. Sandals Royal Caribbean resort is located just short drive from the downtown, between several other resorts. What makes this resort stand out is its private island with a Thai restaurant, additional beach and pool amenities. You can get there by hotel’s boat, kayak or on a paddleboard. A good choice for a couple who wants with an all-inclusive package and prefer smaller and private accommodation. All-inclusive private offshore island with several sandy smaller beaches by piers. 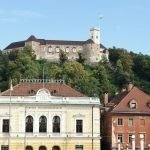 Free shuttle from/to the airport (15 minutes away). Over-the-water private island accommodations make your experience unforgettable. Some accommodation options include swim-up rooms with butler service. A private island has a pool with a swim-up bar and with available hammocks. Various land and water activities. 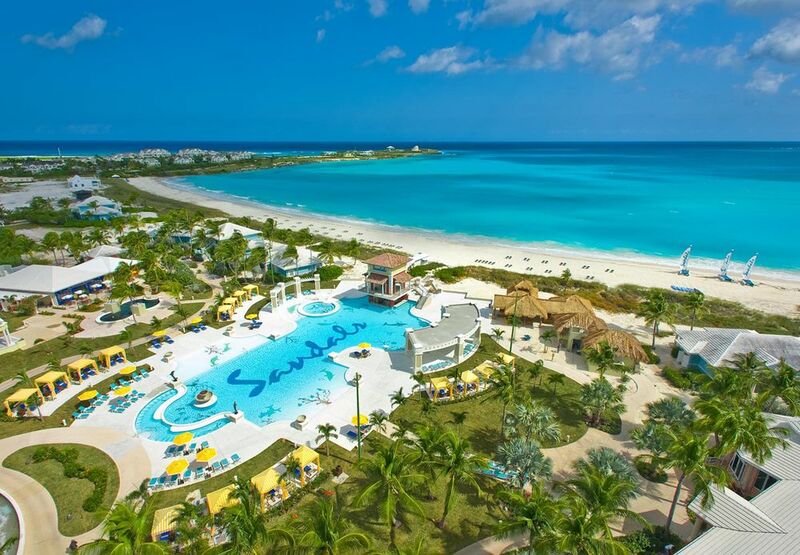 Free “restaurants, bars and activities” options at two Sandals properties in the area with a free shuttle. Daily and nightly entertainment with fun activities. Noise from the airplanes due to resort’s proximity. An extra cost of beachfront cabanas. 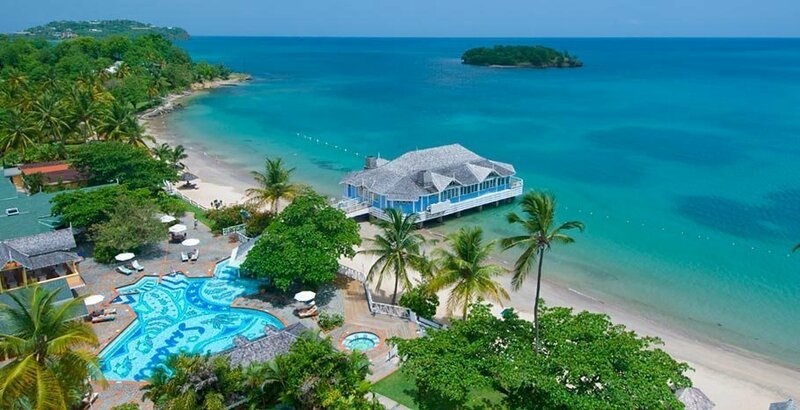 Sandals Negril is nestled on the longest stretch of Jamaica’s famous and beautiful Seven-Mile Beach. The resort is tucked away from the road, but still close enough from tourist attractions like Rick’s Cafe and the cliffs, shops, nightclubs and restaurants. The property is spacious and luxury with all the relaxation and entertainment options you will need. 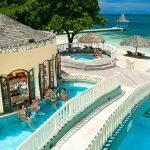 Sandals Negril is a perfect resort for those seeking a large all-inclusive with plenty of activities and amenities and a laid-back vacation. All-inclusive luxury resort set on the largest stretch of Negril’s Seven Mile Beach. Beautiful wide variety of rooms to choose from four-poster beds, modern amenities, whirlpool tubs, large balconies and some with private pools and gardens. Accommodation is just steps from the beach. Many daily land and water activities; nightly entertainment for everyone. Nice spa with well-equipped fitness center. Close to downtown, many local attractions, bars, shops. Free non-stop trip airport shuttle. Free Wi-Fi only in Club rooms. The airport is several hours away from the resort. The ultimate beach resort for your ultimate family vacation. Book Beaches and get up to 65% off, $355 instant booking bonus and MORE! The resort is located amid many other hotels and resorts and only 10 minutes by car from downtown. The resort is situated an hour and a half from the international airport in Montego Bay. Due to property’s quiet and relaxed space, it is perfect for a couple who is looking for relaxation and more private area. All-inclusive with elegant and sophisticated style resort. Elegant large rooms with four-poster-beds, many with balconies, whirlpool tubs; all rooms have wonderful ocean views. Plenty water activities and land activities (golf club, fitness center, pool tables, board games, tennis). Red Lane Spa with a menu of massage and beauty treatments. The most beautiful private beach in Jamaica with chairs and umbrellas, swinging beds, in-water hammocks. “Stay at one, play at two” exchange privileges – access to the other nearby Sandals Resort (Ochi), its restaurants and amenities. Free shuttle service to/from the airport. 5 restaurants with international cuisines; Jamaica’s only Caviar and Champagne bar. A small pool with no poolside drink service. Enjoy the all-Butler experience at Sandals Royal Plantation in Jamaica! Save up to 65% plus one night free when you book Sandals Royal Plantation in Ocho Rios Jamaica. This property, which is surrounded by tropical gardens and ocean views is located 5 minutes away from the downtown Ocho Rios. Several outdoor pools, some including swim-up bars. Plenty of outdoor, water and land activities. Nightly and daily entertainment and theme parties (do not miss night movies played outside). Sandy, private but small beach with wooden docks with a roof. Free shuttle to/from the airport. The spa offers beach massages. Small beach for the size of a property, not long enough for a stroll along the beach. Extra fee for cabana rentals and spa services. An hour and a half away to the airport. Not appropriate for people with disability; the property is huge and confusing to navigate. Extra fee for caddies at the golf course. 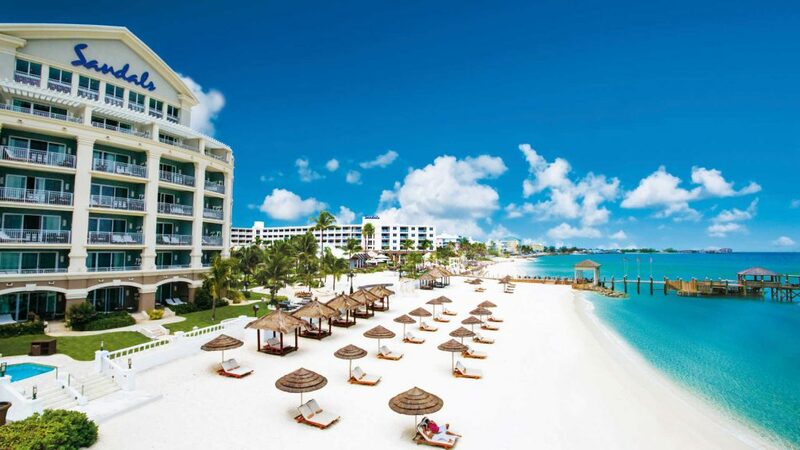 Sandals Carlyle sits in the heart of Montego Bay and a short walk away from a number of restaurants. This property is the smallest Sandals Resort with only 52 rooms. For couples looking small, intimate and budget Sandal resort. Charming all-inclusive resort in the main downtown area of Montego Bay. Convenient location – only 10 minutes from the airport. More intimate and quiet than other Sandals Resorts. Free “eat and play” at other two nearby sister resorts (restaurants, activities). Choose between 3 restaurants and two bars. A large pool and whirlpool with loungers and umbrellas. Daily entertainment and sport activities. A public beach is across the street and is very small, sometimes can be very crowded. The resort is on the busy street and can be very noisy (recommend a room facing the garden). Some rooms are dated and need renovation; most rooms do not have balconies. Butlers are not available at the resort. Nestled within nature preserve, along a long stretch and private beach, alone, with no noise from nearby buildings, towns, cars or airplanes. 2-mile stretch white sand private beach offers you long romantic walks and spectacular views both the sunset and the sunrise. Isolated all-inclusive resort for absolute relaxation. The resort features three European villages: Italian, French and Dutch. 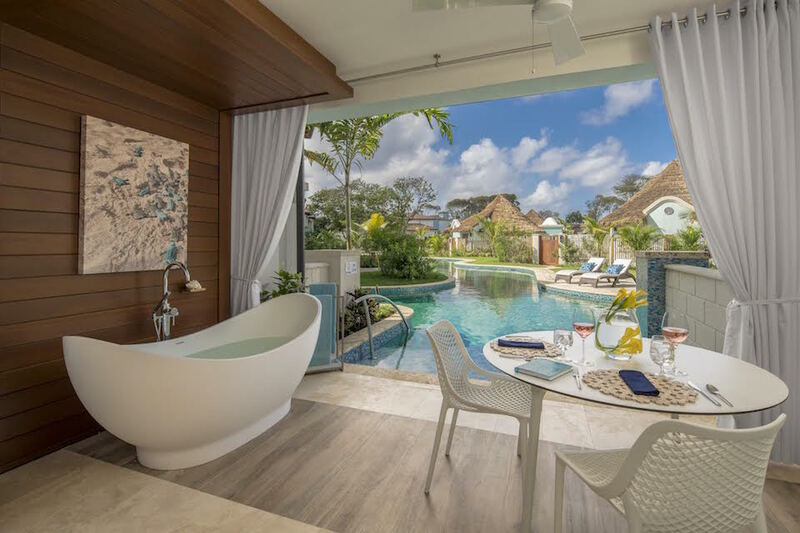 Choose different types of rooms: over the water butler bungalow, penthouses, suites. All of the rooms have an ocean view. Planty of land and water sports. Variety of nightly entertainment, from shows, parties, theme nights to different games. Variety of pools and swim up bars. Red Line Spa offers different services. Free shuttle from/to the airport. 1,5-hour ride from the airport to the resort. The resort is spread and you need to be prepared to walk. Wi-Fi can be available only in some parts of the resort. This resort is considered as the most elegant resorts in Sandals chain. Easy access from the airport, only 15-minutes away. Butler guests receive transportation via Rolls Royce and Mercedes. 2 large pools; one is more for relaxing, the other pool is active with activities. Exclusive private Offshore Island with two cove beaches is like a piece of heaven. One beach is for relaxing and snorkeling, the other is for other water sports. There is a pool with swim-up bar, Red Line Spa and a restaurant. The island is a perfect spot for exploring panoramic views and enjoying nightly entertainment on the island. You can reach the island by boat, kayak or sailboat in some minutes. Plenty of land and water sports. Variety of room type options. Red Lane Spa with indoor and outdoor treatments. Nightly entertainment with a piano bar, fire pits, late night pub. Choose from 10 restaurants and 8 full-service bars. The pools can be cold in winter. A beach area is not big enough and there are limited chairs and umbrellas. The resort sits on a hillside overlooking the ocean, on the Emerald Bay beach, Exuma Island. The property is secluded and is about 30 minutes away from the main city. Pristine, mile-long, private and relaxing beach. You will be able to take walks on the long stretch of white sand. All-inclusive resort with modern 249 rooms and suites with king-size beds and many with private pools. Some rooms are beachfront or a short walk from the beach. A must experience is Exuma Swimming Pigs. You will be entertained day and night from different shows to piano bar, live bands. 3 pools (active pools with music and several quiet pools) with pool bars, 2 whirlpools and Zen gardens. Red Lane Spa features massages and other beauty services. Free non-stop roundtrip airport transfers. Seven restaurants that offer spectacular sunset views. In winter the water is chilly. As the resort is secluded there are few activities available off resort. Located on the tip of this small and friendly island, on a Pink Gin Beach and next to the airport. This property is one of the newest properties in the Sandals resort chain, opened at the end of the year 2013. Nestled in a private area with no other resorts close by. All-inclusive resort with Caribbean’s most innovative and modern rooms and suites with balconies with soaking tubs, swim-up suites etc. Water in winter is warmer than other resorts in Jamaica and Bahamas. The resort includes 4 villages: Pink Gin, South Seas, Lover’s Hideaway, & Italian Village. Dining at 10 outstanding restaurants and 6 full-service bars. Nightly entertainment; experience romantic fire pits in the evening. Best Huge variety of tours available. 5 minutes away from the airport. The beach is small for the size of the property with designated areas for swimming. 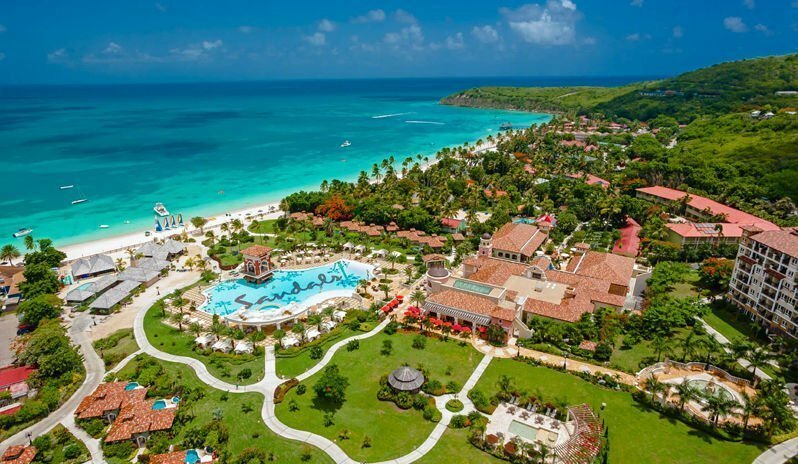 Sandals Grande Antigua is voted the world’s leading honeymoon resort and most romantic resort in Sandals chain. It is set on Dickenson Bay, one of the best beaches in Antigua. The property is close to other resorts. The most beautiful and longest white-sand beach in Antigua. The beach features cooling trade winds and the calmest waters. Good location: close to the capital city (10 minutes by car) and only 20 minutes ride to the airport. All-inclusive resort with lush gardens and two unique villages (one is a Six-star all-suite Mediterranean Village with the style of South of Italy, other is Caribbean Grove with colonial style buildings). Luxury accommodation from standard deluxe rooms to Mediterranean Villa Suites tucked into hidden gardens with private pools. Nighty entertainment from live band and shows to theme parties. A variety of cuisines at 11 restaurants and 7 bars. Plenty of land and water activities. Enjoy a double hammock along the beachfront area. Enjoy the evening with Fire pits. If you would like to discover Antigua, choose local tours. The resort offers 6 pools with swim up bar and 6 whirlpools. The beach is not private and is shared by other resorts and can be busy. It is also populated with vendors. The atmosphere is noisy, so this resort is not a good choice for those looking for secluded accommodation and quiet vacation. The lack of shade on the beach and no umbrellas. The resort sits on a secluded half-mile crescent-shaped beach and a coral bluff. The property is considered as the most glamorous resort in Saint Lucia. The water is sparkling emerald-green and unique among Caribbean sea. Convenient location: only 15 minutes drive to the airport. All-inclusive resort with traditional and modern colonial Caribbean style rooms and suites. The spectacular Sunset Ocean Bluff Suites with breathtaking ocean views, butler service and many with private pools and terraces. The resort features 3 pools. The main oceanfront pool offers a swim-up bar and a waterfall with a lot of activity and music during a day. Daily and nightly entertainment from karaoke, different shows to many theme parties. The property features 9-hole golf course with ocean view. Enjoy access amenities at two other Sandals resorts free of charge. Red Lane Spa with massage and other beauty services. The water can be rough and may hamper swimming and make water sports unavailable. Pay attention to red flags. A limited number of pool chairs and umbrellas. The main pool can get noisy and crowded. The property is spread out hence be ready to walk a lot. This is one of Sandals hotels in St Lucia. Set on its own peninsula, the property offers grand views of the Atlantic and the Caribbean and six miles away from the capital city. Sits between the Caribbean Sea and Rodney Bay – considered as the most beautiful bay and the calmest waters on the island. All-inclusive resort with Caribbean style rooms and suites. Other accommodations they offer are The President Clinton Oceanfront Suite, Beachfront Rondoval Suites, The Over the water bungalows mixed with exotic and luxury style architecture. 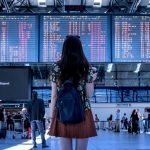 Free non-stop round-trip airport transfers. Plenty of land and water sport activities. Several pool areas. The main pool has a swim up bar. Others offer more privacy with a quieter atmosphere. Daily and nightly entertainment activities. Restaurants from barefoot beach to fine dining; bars including English pub. Stay at 1, Play at 3 Exchange Program (visit other two sisters Sandals on the Island with free of charge amenities). Walking to Pigeon Island, where you can climb, hike. The spectacular views are well worth it. The main pool can get crowded and noisy; pool chairs can be difficult to get. Private beach cabanas come with concierge but cost extra. Set along off one of the Island’s busiest roads, only 10 minutes drive from the capital city. Sits on a stretch sand beach and insulated by thick tropical greenery, from palms, shrubs and trees, plenty of shade to escape the harsh sun. 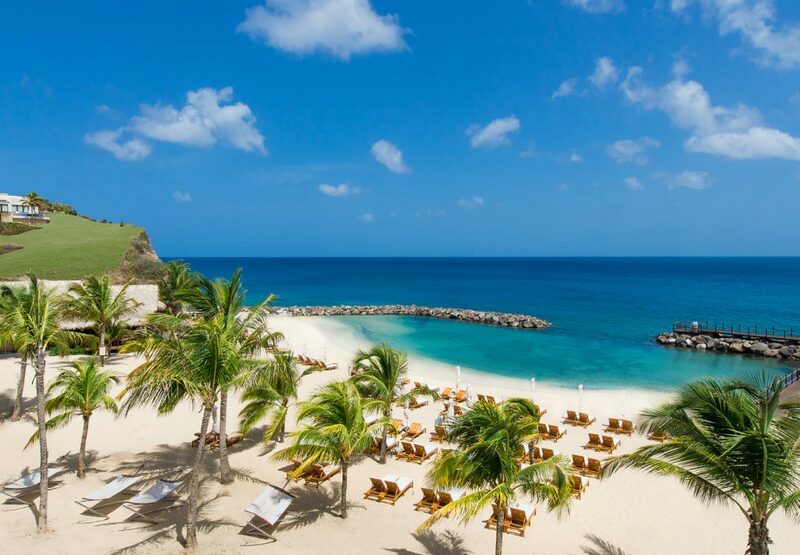 Quieter, more intimate and least expensive of the Sandals Resorts in Saint Lucia. All-inclusive resort with cottage style rooms with stone terraces and all-new Beachfront Honeymoon Butler suites with a private pool and cascade water. 2 pools with swim-up bars, one is more active, another is quiet. Land and water sport activities. There is plenty outdoor lounge space to relax and enjoy – Fire Pits, several cabanas, day beds and hammocks. Stay at 1, Play at 3 Exchange Program – you can access amenities at two other Sandals Resorts for free. The airport is over an hour drive’s away from the Resort. Located close to a busy road. Some rooms need to be updated. Rooms close to the pool can be noisy. The resort is quieter with fewer activities than the other resorts in St. Lucia. The resort is located on the island’s southwest coast, close to the international airport. All-inclusive resort with beachfront luxury accommodation, suites with beach and garden views, new swim-up suites. Set on a private stretch of Dover Beach and lushy landscape. Lots of restaurant choices and bars. Numerous land and water sport activities. Walking distance to the nightlife of St. Lawrence Gap. 3 pools and 2 whirlpools. Most of the beach area is shaded. The water can be very rough. Difficult to find chairs by the pool – reserve yours early in the morning. 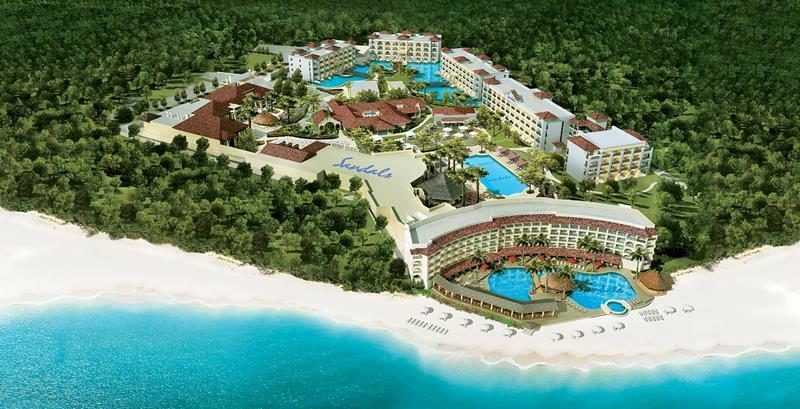 Another of the newest Sandals Resorts is Sandals Royal Barbados Resort. Opened in December 2017 and located in the St. Lawrence Gap area. Outstanding new, all-inclusive resort with all-suite accommodations, including Skypool Suites, Millionaire Suites and Swim-up Suites – all with soaking tubs. This is the Sandals first rooftop pool with a bar, overlooking the ocean. Sandals first men’s only barbershop. Red Lane Spa with different beauty and relaxing treatments. Stay at One, Play at Two Exchange Privileges – free access amenities at two other Sandals Resorts. Enjoy Sandals first 4-lane bowling alley. 2 pools and 2 whirlpools. There is a lack of shade on the beach, only few Palm trees. Sandals Royal Barbardos has been recently modernized and now has 50 top luxury suites. It has now a total number of 552 of suites offering the highest level of service. We visited Sandals Barbados in 2015, some of the negatives I can see, the butlers reserving chairs that are never used is very unfair. Other chairs that are not butlers were cleared after an hour of non use though. Barbados is gorgeous and the food was excellent, butch’s do a great steak. The staff in the Merry Monkey are great and its a nice cool place to hang out if your over heated. We staying in the crystal lagoon room and its stunning. Its a small resort yes, but it’s expanding hopefully with more pools. We are hoping to visit Grenada this year. My wife and I have been to Sandals twice. Both times we have been to Grand Riviera also know as Ocho Rios and now Ochi. Don’t know why they keep changing the names. Anyways we both had a wonderful time and were treated like royalty. The resort was always very clean, rooms were good. We stayed on the ocean side, never was bored. The food was good, the only thing I wished for was bigger portions at some of the restaurant’s. We were there in 2010 as well as 2014. The reason we went back was there was a lot of remodeling going on in 2010 that we wanted to see if completed. We are actually going on our 3rd Sandals trip in the next 10 days. 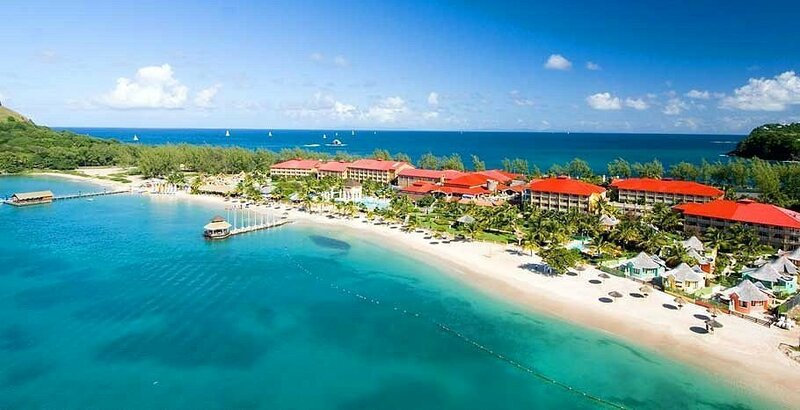 We will be going to Sandals Halcyon in St Lucia. Hoping that we have just as good of a time in St Lucia as we did in Jamaica. Hope our Sandals resorts review were helpful enough. Enjoy your vacation at Best Sandals resorts and keep on following us on safarinomad.com! Hello. 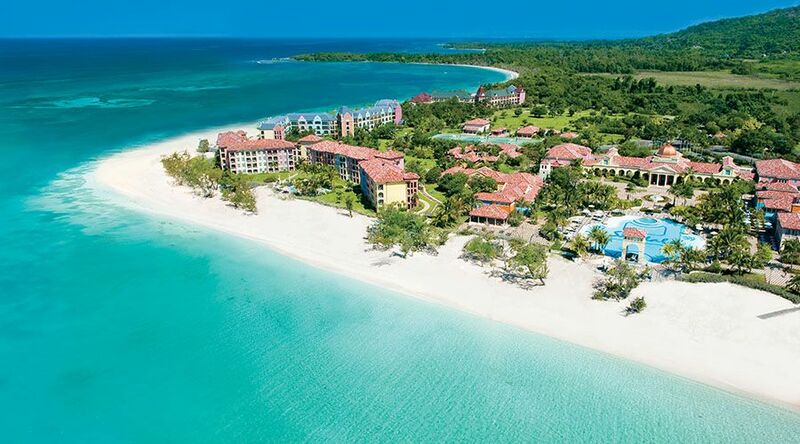 We are planning an adult group trip to Sandals Royal Caribbean next May (2020). I have read many mixed reviews about this location. However, I know not every location is going to fit everyone’s personalities. Have you personally been to this location? If so, what were your thoughts? Do you have any suggestions to make our trip more enjoyable? Hi Lisa, We haven’t gone to this one. In general the reviews I have heard about it are very positive. Check at the top I added a special deal of $ 1000 booking credit valid till 30th April. Sandals Royal Caribbean was our second Sandals trip – it is lovely, not one of the ones with a huge pool but great activities at the pool. And a fun “junkanoo” type beach party. The separate island and restaurant are great – you’ll have a super time. We are headed to Royal Barbados on May 7th and this will be our 8th trip!! Thanks for your comment Elizabeth, enjoy your holidays, Sandals is amazing! !